If you would like to become a distribution partner or stock our digital photo frames in your shop then please get in touch. We are always keen to meet enterprising businesses who would like to join in our success. We now have a number of very high profile retailers and the Living Images Brand is now available in over 1,500 high street shops as well as other successful internet retailers. The growth of the digital photo frame market has meant that many new entrants are selling cheap their digital photo frame and digital picture frame in the UK and European markets. These frames frequently do not comply with the RoHS and CE legislation and many come with power supplies that are illegal and dangerous and we caution anyone from buying digital photo or picture frames without being sure of they conform to the appropriate legal requirements. 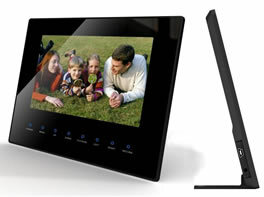 As digital photo frames have an electrically powered LCD screen and are in effect an LCD Digital Photo Frame they, very obviously, need to be specified and manufactured to the highest possible standards. Our Living Images Digital Photos are all RoHS and CE compliant. Please contact us on 0117 330 2277 or email us on support@digitalframesdirect.com to discuss your digital photo frame requirements.